This isn’t new – it comes from back in December last year but I’ve only just discovered it and thought its worth passing on because it’s kind of interesting. 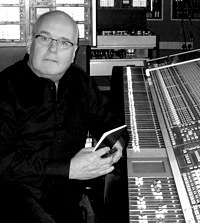 Its an interview on the Australian EMI site with Richard Lush – who worked at EMI during the 60’s as second engineer to Geoff Emerick recording the Beatles. As he says in a great quote from the article:”….I did 105 sessions; 105 days I walked across Abbey Road and went to work for the Beatles….”. Not many people can make that claim. Anyway, check out the interview in full – its worth a read. This entry was posted in Beatles, Beatles Music, Beatles Related, John Lennon, Plastic Ono Band and tagged Apple Records, Beatles, Beatles Collecting, Beatles Related, John Lennon, Magical Mystery Tour, Plastic Ono Band, Recording the Beatles, Revolver, Richard Lush, Sgt. Pepper, White Album by beatlesblogger. Bookmark the permalink.